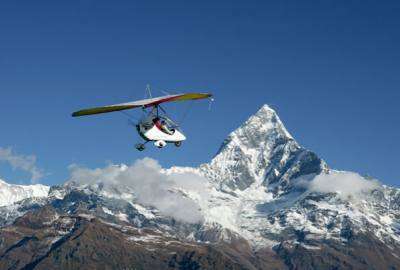 Wilderness Excursion offers so many fun facts about Nepal adventure activities, magical Mountain Flight around Mt. Everest is one the tremendously life time holiday experience to do among them. The one-hour mountain flight through various domestic airlines; from Kathmandu airport takes off daily early morning, worth great Himalayan scenery including Mt. Everest. Mountain Flight trip is suitable for short time Nepal visitors who restricted by time from going a Himalaya Trekking can see a magical view with eagle eye-view just in an hour As the plane flies along, the mountains come closer and closer. First, visitors see Shisha Pangma (8013m) and next on the vision is Chhoba Bhamare, Dorje Lakpa, Phurbi Chakchhyu on the right which looms over Kathmandu Valley. As the plane moves on you will see Gaurishanker, Melungtse, Chugimago, Numbur, Karyolung, Cho-Oyu, Gyachungkang, Pumori, Nuptse and, of course, Everest finally. Mountain flights are offered by several airlines in the morning from the domestic airport in Kathmandu. Flights from Kathmandu reveal the Eastern Himalaya, while flights from Pokhara take you on a bird’s eye view of the Western Himalaya as well. Wilderness Excursion offers mountain flight daily in the morning with various airlines including Buddha air. Wilderness Excursion staff will pick you from your hotel at 6:00 am and takes you to the domestic airport for your once in lifetime Everest Mountain Flight. Everest Experience is a close-encounter mountain flight-seeing tour with Buddha Air. Indulge in the panorama and maybe, just maybe, you might realize what you have been missing, or find what you have been looking for, all this while. After all a trip to Nepal would be incomplete without truly understanding what really makes it beautiful. Nothing compares to the sheer beauty or awe, the Himalayas has to offer. Take the mother of all mountain flights, the Everest Experience where we put you, one on one with Mt. Everest, so close that you can almost touch it. 7:45am : Pick up from airport and transfer to your hotel. Trip Note:- Free cancellation for this flight is up to 72 hours before the flight time. If cancelling less than 72 hours before the chosen start date no refund applies. Fly over Mount Everest, the head of the world. Feel thrill and amazing drift over the Himalaya and Capture some of unbelievable scenes in your memory, Enjoy window seats for every passenger on small group tours, Everest, Lhotse, Makalu and many other peaks.